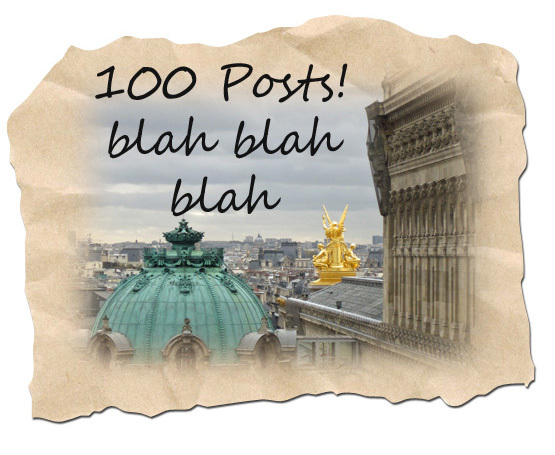 Life, Laughter and Paris: 100th Post! And now I’ve written 100 posts! YAY ME! When I began this blog in June, I had absolutely nothing to say. I wasn’t even sure what I was supposed to write in a blog. Now, I can’t seem to shut up! I know 100 posts isn't many to veteran bloggers, but to me it seems like a LOT! I wonder how many people are writing a post almost every day – must be thousands. And everyone is writing something different. Imagine that! All those words and ideas out there just waiting to be read. I bet someone has put the secret of life in a blog and I’ve missed it. I’ll have to run it through Google and see what happens. Blogging is addictive. For some it’s a diary, for some a way of collecting their thoughts. Seems to be a blog on every subject you can think of. I came across several blogs on several periods of history that interest me and wonder how they can research the facts and post something different EVERY DAY! It’s fabulous. As for me, I’m blogging for fun and to connect with people. I like to laugh, and when someone comments that they LOL to a post, it makes my day. So, thanks for reading. Hopefully I’ll improve as I go along, and I’ll try not to bore you. On that note, here's my thought for the day - isn't it odd how the word "Lady" presents different images to different generations? Hmmmmmm. Congratulations on hitting the century mark! You always make me LOL! 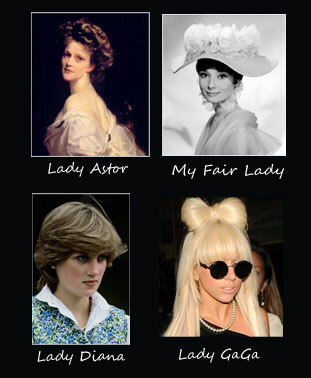 Wow, four very different "ladies" for sure! Aside from that observation, I too enjoy your writing and sense of humor. And right this minute, I'm listening to Piaf CD and all is right with the world:) Have a great week end. Edith Piaf on a Friday night.....what could be better? Thanks Merry! Sounds like you've got the hang of blogging!